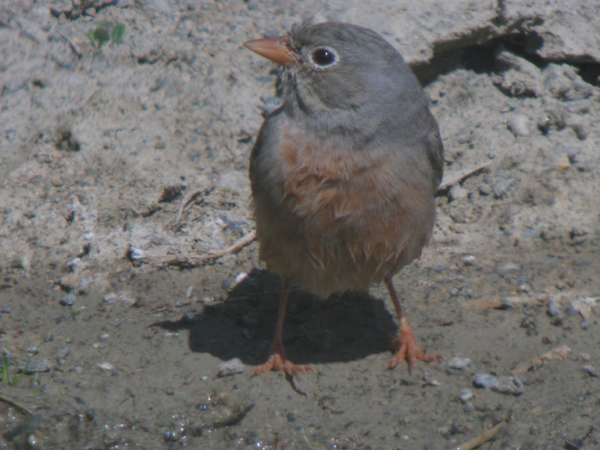 It is time for yet another series of photos of a bird hanging out at a waterhole in Kazakhstan. This time the Grey-necked Bunting (Emberiza buchanani) gets the honors, and, let me tell you, it deserves them. 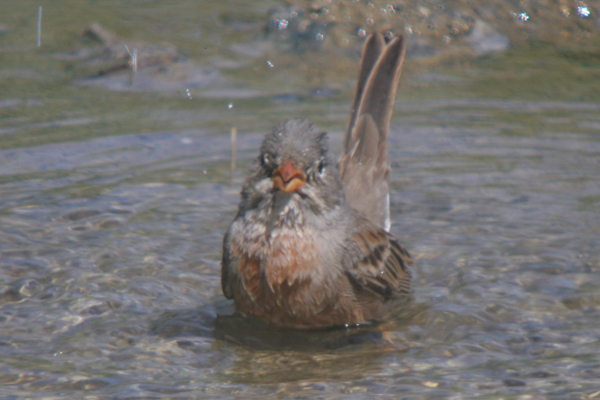 Not only did this bird take two water baths in full view at relatively close range when the sun was behind us but it also preened the heck out of itself, also in full view with the sun behind us. It was quite a show! The Grey-necked Bunting is, like the New World sparrows, a member of the family Emberizidae, so if it were itself a New World species it would almost certainly be called a sparrow. Of course, the Grey-necked Bunting is an Old World species that exists almost entirely just in Asia, though its breeding range does reach Finland and Russia. 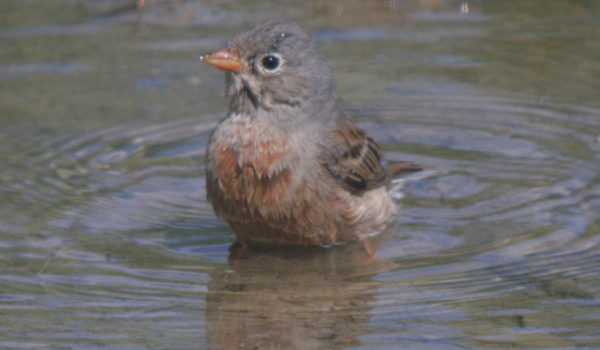 The Birds of Kazakhstan, which is considered the premiere book on what species occur in Kazakhstan, reports that only the subspecies Emberiza buchanani neobscura occurs in Kazakhstan, so it seems safe to assume that it is the subspecies pictured below. 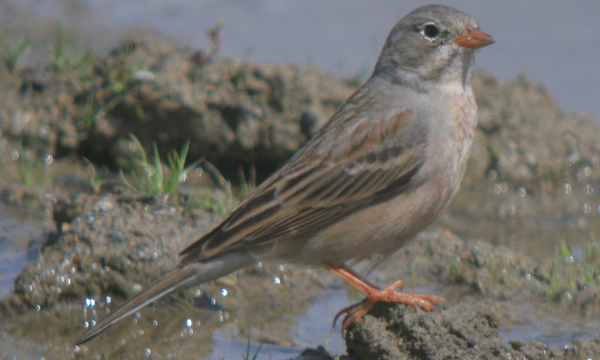 BirdLife International considers the Grey-necked Bunting a Species of Least Concern due to its robust range and population, though its population trend is unknown. 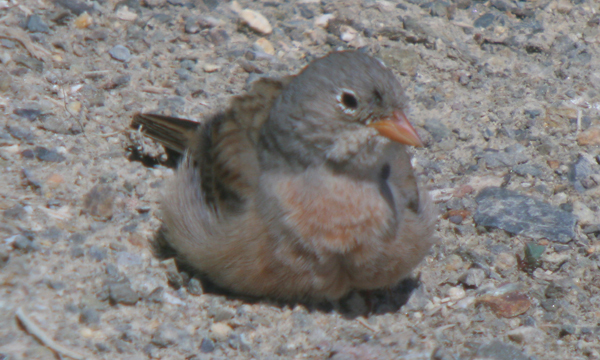 Anyway, to say the least, I enjoyed seeing and photographing this species, which superficially reminded of nothing so much as a Field Sparrow (Spizella pusilla), though, from what I understand, it is actually much more similar to another Old World bunting, the Ortolan Bunting (Emberiza hortulana). No matter what it reminds you of please enjoy the pictures! This post has been submitted to Bird Photography Weekly #47. Go check it out! My trip to Kazakhstan was made possible by the wonderful folks at Swarovski Optik who sponsored the trip not only to draw attention to their marvelous optics but to the fact that Swarovski Optik is, with the RSPB, the Species Champion for the Sociable Lapwing, a critically endangered species that breeds almost entirely in Kazakhstan. We here at 10,000 Birds, the only blog designated a Species Champion by BirdLife International, salute Swarovski Optik‘s commitment to conservation. To learn more about 10,000 Birds’ commitment to conservation through BirdLife International’s Species Champion program and what it means to us at 10,000 Birds (or to donate to the program through 10,000 Birds) just click on the nice Species Champion logo to the right. You’re right, that does look a lot like a Field Sparrow. You can tell it is a robust species by the fact that the emerging seal (headshot on picture 3) didn’t scare it a bit. Corey, I think here’s a blog you should start to read regularly, for obvious reasons. Laurent is French and moved to the US a few years ago. He also happens to be a good friend of mine from Ann Arbor. Delightful series, Corey. By the end of the photos, I’d developed quite an attachment to the little guy. Adorable, in a very sparrow-like way. And I’d second Jochen’s recommendation of Laurent. But then, we all know Ann Arbor bloggers are the best! Great shots of water-gymnastics and bird-yoga and of cource a bit of Naccissism thrown in as well. Excellent series Corey! 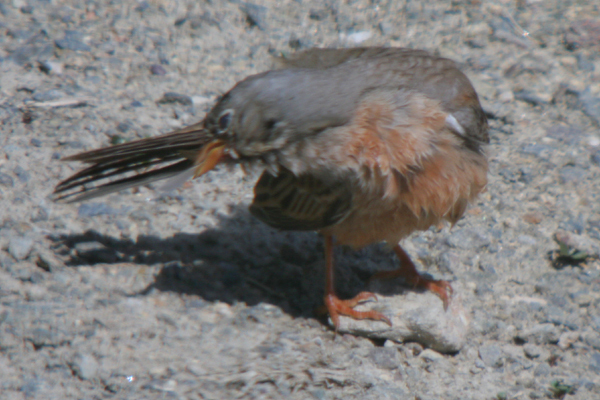 Reminds me somewhat of the Snow Buntings we get here in Maine. GReat series! 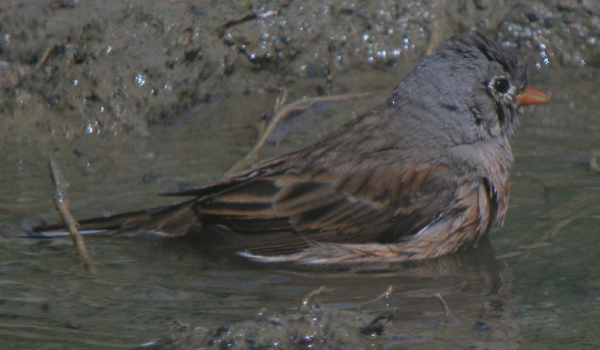 Love those bathing and preening photos! Lucky you! Thanks for the giggle. He looks so cute :D! Great series Corey. I thought the show was over at photo 7 when the little guy came out to pose but then it went back for another bath! 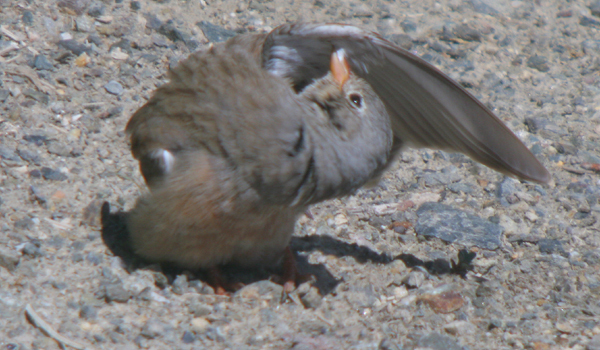 That is one clean looking bunting in the last photo, and so cute too. 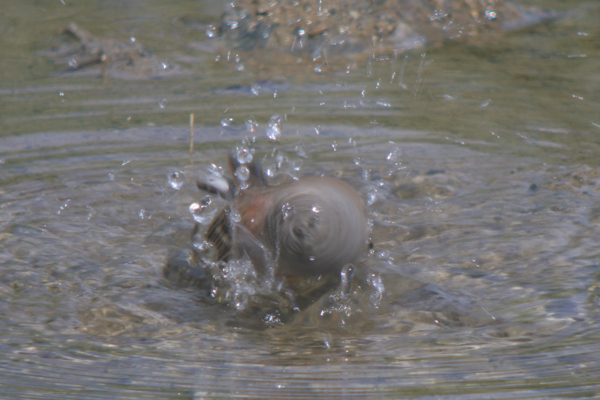 Love the head shaking shot. Isn’t it amazing how fast birds can move? When is a Tanager a Cardinal?